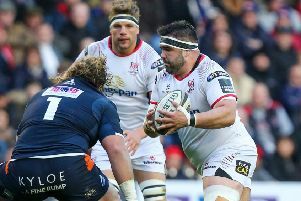 Ulster captain Rory Best said the victory over Leicester Tigers in the opening Pool Four match gave the side confidence moving into a tough arena this weekend. The Irish Province’s 24-10 win over the English club put them top of the group on points different from their French opponents this Saturday evening, Racing 92. Ulster go to Paris to play not only on a 4G pitch but indoors at the Paris La Defence Arena. Racing - beaten finalists last season - squeaked past Scarlets in the other pool four game on the weekend, 14-13, to set up a game this week which gives the victor control of the pool even after round two. “They’re a quality side. I don’t think we’re going to have to worry about the rain,” smiled Best. “It’s going to be a tough challenge. If we thought that Leicester were big then Racing are going to take it to another level. “They’re a team that are probably second favourites for the competition. It’s a massive ask and it’s going to be a massive task but since the Heineken Cup was revamped, there aren’t any easy groups. “We’re away to the top seeds. We’ll go there and we’ll prepare like we always do. We’ll aim to take a big step forward. Best admitted winning against Leicester, particularly after back to back loses in the PRO14 had taken a bit of pressure of externally. But he added: “As everyone knows, if you want to be in the mix come January (for the quarter-finals), you need to win your home games. “I think internally, we put a lot of pressure on ourselves to back up the performances. “It’s something we’ve been guilty of in the past couple of seasons. It’s important we back it up. “If you go back to last season, we played La Rochelle here and put in a big performance and then we went away to Wasps and flattered to deceive.